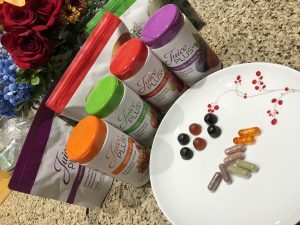 Juice Plus | What is it? | Juice Plus by Awkward; Yet Healthy. So what IS Juice Plus anyway? Is it magic? Will it make me look like Beyoncé? Nope. Sorry. BUT WAIT. Before you run away, let me tell you what it REALLY is. Or maybe what it isn’t…because that’s easier. Juice Plus is NOT a vitamin. It’s food, not a multivitamin. It has a nutrition label, not a supplement label (So even the US government agrees that it’s food!). The powder inside those capsules is straight up vegetables, fruits, and berries. They are picked at the peak of ripeness, flash frozen, crushed up peels and all, and then dried at a low temperature. What you’re left with at that point is all the phytonutrients found in the produce. The water, sugar, and other ‘macro’ nutrients we tend to think of are all removed. So picture this; we create vitamin C in a lab and put it in a pill to imitate one chemical compound found in an apple. But there are over 10,000 chemical compounds in that apple! And they’re all there in just the right amount to work together and our bodies know EXACTLY what to do with it in its natural format (aka we don’t just pee it out like we do with those vitamin C horse pills we all grew up taking). So, with Juice Plus you get your precious vitamin C, but also the 9,999 OTHER compounds we need from that apple. Hence the nutrition label instead of a supplement label. Could you imagine a supplement label with 10,000 vitamins listed?! 2. Juice Plus is NOT a supplement. Sounds redundant, right? Unfortunately ‘vitamin’ and ‘supplement’ can mean different things. Juice Plus is not meant to be a supplement in the way that we tend to think of them (read as ‘replacement’), it is better described as a concentrate. A whole food concentrate that is! It’s like the Jetsons y’all! Someone finally put a salad bar in a capsule! That being said, Juice Plus is not intended to replace fresh fruits and veggies in our diets. Sorry veggie haters! What we need to remember here is that it is recommended that we eat 7-13 servings of fruits and veggies EVERY. SINGLE. DAY. Most of us don’t do that. Which is why Juice Plus is so genius, it bridges that gap for us! 3. Juice Plus is NOT a magic pill. Now all of these outcomes of Juice Plus take TIME. Just like any impacts from lifestyle change will. Some people see results quickly when they start their Juice Plus journey, but for others, it may take a while before they notice the subtle changes. Just remember, you cannot FEEL your arteries clogging, your intestines becoming inflamed, or fat being stored. Good health tends to be silent and stealthy…. unlike illness is doesn’t come on in one big rush. 4. Juice Plus is NOT expensive. 5. Juice Plus is NOT complicated. New health regimens can feel SO complicated. Starting a new plan can take a lot of time, studying, planning, prep, and personal sacrifice. Not so with Juice Plus! An adult takes 6 capsules every day with a glass of water. That is less than a minute of your time that takes no planning, no prep, and no physical effort on your part. It is not a difficult thing to do! A child eats 6 gummies every day. My boys take them down in 20 seconds or less and often ask for seconds (another bonus, you can’t take TOO much. Potty training bribes anyone?!). I love that they love the chewables. My boys happily eat them and I get to ditch the mom guilt. Everyone wins! With Juice Plus as such a convenient and affordable option the only thing holding you back from better health… is you. So there you have it, folks! That’s what Juice Plus is! Or, well, what it isn’t. Oh, and those fancy looking orange capsules? They’re the Omegas! And the ROCK! Now that you know what this stuff is, maybe you want to come hang out with me in my Facebook Group! We’re not all JP all the time. We’re really just a group of awkward weirdos trying to live our best lives! Or maybe I scared you and you just want to get Juice Plus. Well, then go HERE!